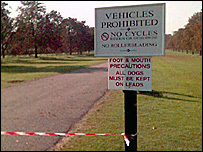 Footpaths and car parks at Windsor Great Park in Berkshire have been closed off because of the latest outbreak of foot-and-mouth disease. Large parts of the Royal Borough of Windsor and Maidenhead are included in the 10km (6.2 mile) control zone set up around a farm near Egham in Surrey. 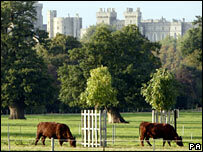 Cattle there were confirmed as infected on Wednesday - only a week after the UK was declared to be free of the disease. The Crown Estate has now shut most of the park to public access. The areas closed include: The Long Walk from Albert Road to the Copper Horse statue, The Deer Park, The Savill Building and Savill Garden, Virginia Water, Valley Gardens along with all car parks. Officials have put up signs, fences and cordons around the park and disinfectant pads by gates into the park. All events due to take place in the park "in the near future" have been cancelled, including the Ladies 10k run on the 29 September and Windsor Half Marathon on 30 September. The National Carriage Driving event, scheduled for this weekend, will no longer take place and three guided weekend walks have also been cancelled. The Guards Polo Club has also ceased its operations and all horse riding permits for the park have been suspended. In a statement, the Crown Estate said it had decided to close "the majority of Windsor Great Park for general public access, in the interests of protecting tenant farm stock and Crown Estate livestock. "The closure is likely to remain in force until further advice has been received from Defra suggesting that it is safe to reopen." Preliminary tests have showed that the outbreak on farmland near Milton Park Farm, Egham, involves the same strain of the virus which escaped from a government laboratory near Pirbright during August. Cattle and pigs at another farm nearby were also being slaughtered on suspicion of infection, Defra said. A movement ban is in place, and the EU has stopped animal exports. The Royal Borough of Windsor and Maidenhead's trading standards service is providing information and advice to farmers and helping to enforce movement and bio-security controls in the area to prevent the virus from spreading.